Laugh with/at Donald Trump with the only humorous novelty dollar bill that's Made in the USA (or possibly Mexico - but probably the USA...yes, it's definitely the USA)! 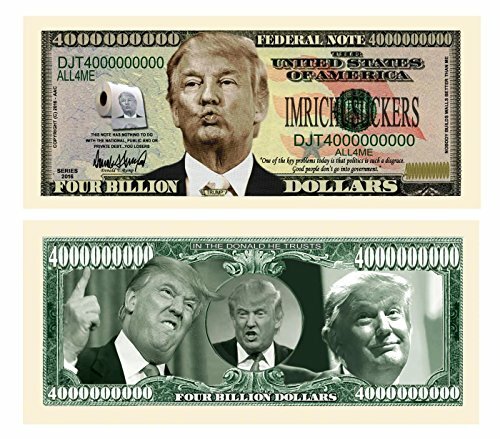 This Dump Trump 4 Billion Dollar Bill is set to become one of the most sought-after novelty collectors items of the 2016 Presidential Campaign Unleash the hilarious power of "The Donald" on your friends, family and work colleagues! We created this political gift/keepsake for those who believe politics truly is a laughing matter. This Novelty Note makes a great stocking stuffer and collectible gift for the politically minded. We aspire to provide you with best services to be you completely satsified.